This skull is a replica of Dawson's so-called "Dawn Man," which had been unearthed in a gravel pit at Piltdown near Sussex, England, by Charles Dawson in 1912. 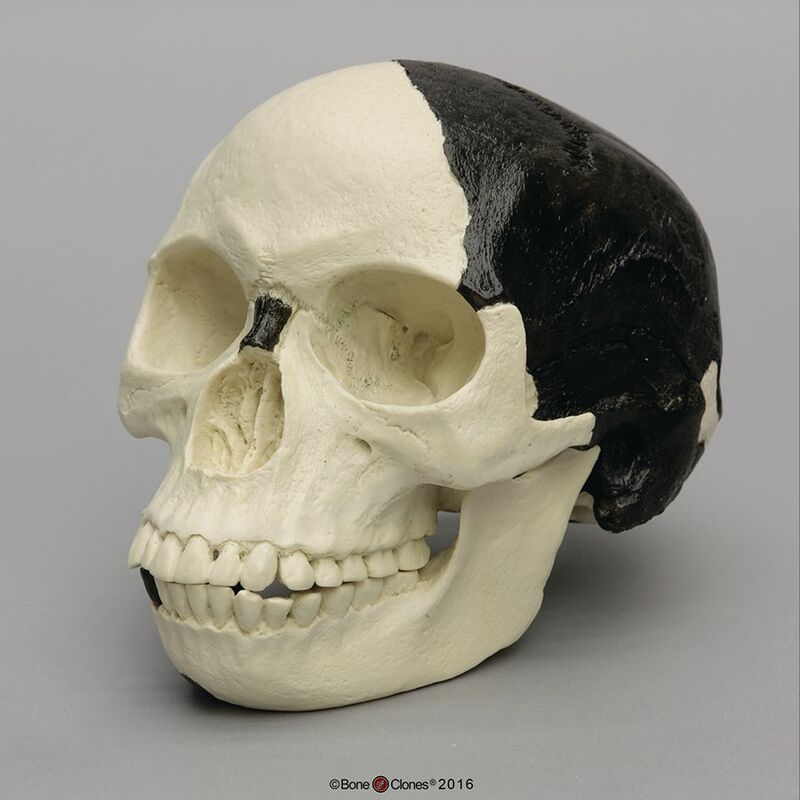 The find consisted of a modern human appearing cranium, with a human sized brain, combined with a primitive apelike jaw, and was found near the remains of extinct animals dated at 500,000 years ago. For 40 years the skull bones of ""Dawn Man"" were considered genuine and hindered understanding of human evolution by supporting the biased view that a large brain led the evolutionary way toward modern humans. By 1953, the discovery of more hominin fossils, the application of fluorine analysis and the work of anatomists and an archeologist exposed Piltdown Man as a hoax. The ""find"" turned out to be a modern appearing human cranium and the mandible of a modern orangutan, buried along with the bones of the extinct animals. Unfortunately, this hoax misdirected anthropologists for some time, contributing to the original rejection of the Taung Child (which had a jaw of human-like features and an ape-sized brain, a reversal of the pattern observed in English Piltdown Man) and also suggesting that pre-Homo sapiens existed in Europe, a view which has since been discredited. A new paper published in the Royal Society Open Science Journal by De Groote et al. (2016), has demonstrated that a single person was behind the hoax, the original discoverer of the “finds” Charles Dawson. Dawson was a solicitor and amateur geologist and archaeologist looking for “…scientific recognition and, in particular, his ambition to be elected a fellow of the Royal Society” (DeGroote et al. 2016). The Piltdown Man hoax serves as a cautionary tale for scientists to remain objective and transparent in their analysis, not to hoard their discoveries, and allow their findings to be subjected to scientific scrutiny. This skull makes a great addition to the BoneClones® How We Got Here Skull Sets.